Harnish GMC Van Conversion Depot. We are proud to be Explorer Van Conversions largest volume dealer in the Pacific Northwest. We have luxury conversion vans in stock for immediate delivery at fantastic prices. 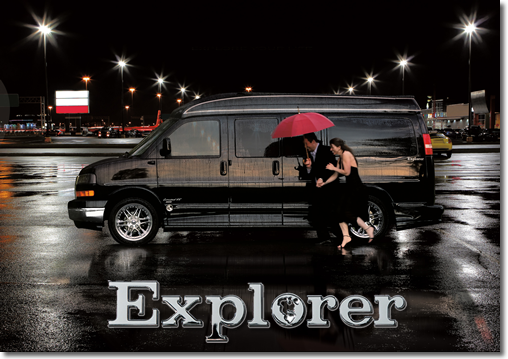 Call Gary Harnish "Your Explorer Van Expert "
for more information regarding van availability. Guaranteed Best Deal on a New Explorer Van! Harnish Conversion Van Superstore takes pride in being one of the Largest Explorer Conversion Van Dealers in the United States. With a great selection of new conversion vans always available. We have a custom conversion van that is perfect for you and your family. From luxury high top vans to mobility vans with wheel chair lifts. 2WD, AWD, extended vans all waiting to be delivered to you at everyday low internet prices... We specialize in Chevrolet Express Vans. Conversion vans by Explorer Conversion Vans at the very best price. Here at Harnish GMC Chevrolet Explorer Conversion Van Superstore we pride ourselves on providing the best vans money can buy. Drop us a line and we will send you an invoice with a cost quote. Proudly serving Nationwide plus Seattle, Olympia, Spokane, Washington State, and all of the Pacfic Northwest.